The Lightning Show-1939 black roan. Sired by Governor Blue (r), out of Mary Roan (r). Whirling Bandit-1952 bay roan. Sired by Gay Bandit (r), out of Chiefs Whirling Columbine (r). Soda Club N Fuzz-1962 bay roan. Sired by Bourbon Gay Montgomery (r), out of Valiant Fox (r). 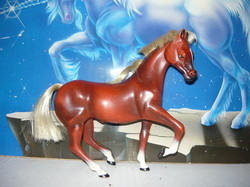 Secret Inspiration-1982 chestnut splash. Sired by Uptowns Inspiration (r), out of Secrets of Stonewall (r). 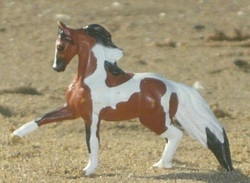 Secret Of The Vale-1987 chestnut tovero (tobiano+splash). Sired by Secret Inspiration, out of Caravelle (r). American Requiem-1990 palomino. Sired by Midnight Requiem, out of American Princess. Bred by Jennifer Lambert. 1999-All American, smoky black spotted blanket Saddleloosa colt (x WindsongSupreme) o/b Spur Star Ranch. Blue Northern Spark-1993 gold champagne. Sired by Callaway's Blue Norther (r), out of Sparkle Plenty. Bred by Indigo Creek Stables. He's been trained to do the Spanish Walk. 1998-Newbie Alert, bay tobiano colt (x Midnight's Summer Dream) o/b Pied Piper Ranch. 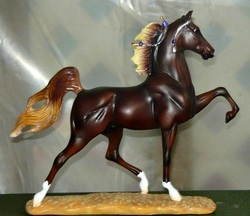 Wild & Wicked-1996 liver chestnut. Sired by Fairwinds Nakanawa, out of Bi Mi Champagne Fiesta (r). Bred by ? 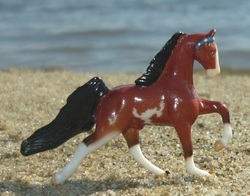 Take Command-1996 chestnut. Sired by Harvest Commander (r), out of Premier's Supreme Fancy (r). 2003-Commanding Wishes, bay colt (x Three Wishes) o/b Shadow Wolf Stables. 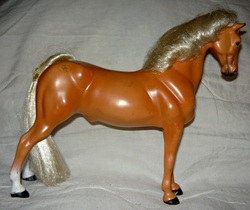 Modern Requiem-1997 palomino roan. Sired by American Requiem, out of Just a Modern Cinnamon Swirl (r). 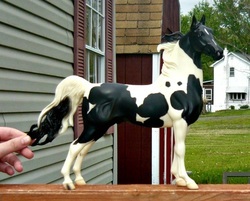 SK Supreme Ambition-1997 black tobiano. Sired by Firewin Suupreme, out of Firewind Bronze. Bred by WMHS. 2006-Ambitious Heir, black tobiano colt (x The Heiress) o/b Shadow Wolf Stables. Double Digits-1999 gold cream champagne. Sired by American Requiem, out of With Smoke And Mirrors (r). Captivating Spirit-1999 chestnut splash. Sired by Inspirations Choir Boy-r, out of Captive's Marquise-m. Bred by Shadow Wolf Stables. OF Grand Champion, NSH Parachute. Outta The Bottle-2000 gold champagne. Sired by Dellview Dare Time (r), out of Stars Lady Lenore (r). 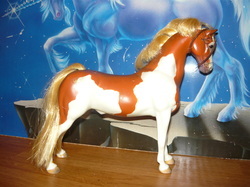 OF Breyer, 2013 Holiday Horse. 2005-Dustonthebottle, classic champagne colt (x Basic Ebony) o/b Shadow Wolf Stables. 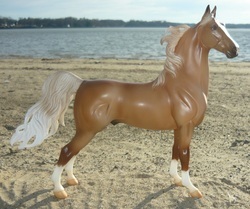 Splashin' Snowmane-2000 flaxen liver chestnut. Sired by Steppin N Splashin, out of Brandi Whine. Bred by Pied Piper Ranch. OF Grand Champion, Snowmane/Snow Mane. Slightly trimmed mane and tail though. 2009-SSR Splashin' Society's Ego, flaxen chestnut tobiano colt (x Societys Enchanted Lady) o/b Spur Star Ranch. Chestnut splash/sabino DA Fizzical Boom! Hot Charming Steel-2000 gray (black base) sabino. Sired by Bucks Charming Genius-bso, out of Steele Lady. Bred by Shadow Wolf Stables. OF Breyerfest 2013 SR, Ryman. Maelstrom Nyte-2001 bay. Sired by Lammas Night, out of Tempest. Bred by Legacy Farms. 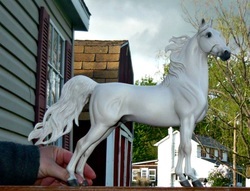 OF Breyer Trad, Blue Note. 2007-Gone Tempest, bay roan colt (x Lady Gone Clubbin) o/b Shadow Wolf Stables. Moonlit Cocktail-2004 sable cream champagne. Sired by Winsdown Black Gold (r), out of Moon Maiden. Bred by Shadow Wolf Stables. 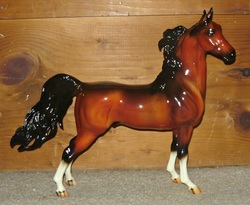 OF Breyer, Lonesome Glory, 2016 Holiday Horse, Woodland Splendor. Compass Kinex-2005 gold champagne. Sired by Kinex (r), out of Golden Compass. Bred by Legacy Farms. Hot Commander-2005 bay sabino. Sired by Hot Charming Steel, out of Commanding Rhythm. 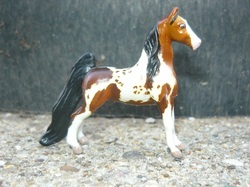 CM Breyer Mini Whinny done by Ariel Williamson. Carnivals Amber King-2006 amber champagne tobiano. Sired by Outta The Bottle, out of Carnivals Flashy Sassy (r). Esquire's Andre-2007 bay tovero. Sired by Esquire, out of Andraste. Bred by Legacy Farms. CM Breyer Micro Mini done by Ariel Willimamson. Homozygous for Tobiano, will always toss that. Enchanted Pirate-2007 bay tobiano. Sired by Tortuga, out of Societys Enchanted Lady. Bred with the help of Legacy Farms. Sterling Commander-2009 gray (palomino base). Sired by Sterling Archer, out of Commanding Rhythm. Bred with the help of Legacy Farms. Why Is The Wine Gone-2013 amber champagne roan. Sired by Outta The Bottle, out of Neverroan. Pass The Bubbly-2015 gold champagne roan toabino. Sired by Fame N Champagne, out of Neverroan. Bred with the help of Legacy Farms. Great grandson of Outta The Bottle who stands here.